Marestail / Horseweed pre-bolt stage. Gary Stone Photo. Early Detection and Rapid Response (EDRR) is a concept to identify potential invasive species prior to or just as the establishment of the invasive is taking place. An Integrated Pest Management plan (IPM) can be developed to manage, contain and eradicate the invasive species before it can spread further. This will avoid costly, long-term control efforts. This article on Marestail will focus on management of the weed in pasture and rangeland. Marestail or Horseweed is a native annual forb. With the advent of no-till farming practices and repeated use of glyphosate products, Marestail has become glyphosate-resistant and a major weed problem in the corn and soybean areas. Marestail is also resistant to some ALS inhibitor (amino acid synthase) and PPO (cell membrane disruption) herbicides. In recent years, Marestail has increased in the pastures and rangeland of the Panhandle and Sandhills. It is speculated that the reason for the increase is due to the cool wet springs we have had, causing an increase in seed germination. It is not understood why some plants may seem to be cyclical in their growing patterns. While these plants may not be glyphosate resistant, ranchers are concerned they are losing valuable grazing due to this plant. Questions that need to be answered about Marestail in grazing situations are - Does the high density of Marestail in the pastures and rangelands affect desirable forage? Does a high density of Marestail discourage grazing? Do some herbicide applications after early May still have an effect on controlling Marestail? Wil it be profitable to conduct herbicide applications to manage this weed in rangeland situations. Origin: Native throughout much of North America. Numerous Native American peoples used the plant to treat various ailments. Ecology & Habitat: Marestail is a winter and summer annual. It reproduces / spreads by seed. Seed viability is generally 2 to 3 years, but some studies have found seed viable after 20 years in pastures. The seed does not need a dormancy requirement to germinate. Seeds germinate on or near the surface of the soil and form a rosette. Seed is generally spread by the wind. Mature plants bolt and form a series of seed heads and have a tap root system. Marestail can grow in height from one to 6 feet or taller. Total seed production is proportional to plant height with taller plants producing up to 230,000 seeds. Marestail can be found in grasslands and disturbed sites, including riparian areas. The plant is adaptable to a broad range of soil conditions and types. Marestail / Horseweed pre-bloom stage, Gary Stone Photo. Marestail contains tannic acid, gallic acid and volatile oils that may cause skin and mucosal irrigation in animals and humans, especially horses. Marestail also contains allelopathic chemicals, which can inhibit germination and growth of several other plant species. Herbicide resistant biotypes have developed over the years. Having well-established grasses and forbs on a well-maintained pasture or rangeland with proper grazing and rotational grazing techniques help minimize the plant’s impacts. Scouting, monitoring and proper identification are key factors for management. Infestations and spread of this weed can occur very rapidly. Pulling or cultivating small Marestail plants can be an effective control method, as long as the plants are young, before they bolt and form seed heads, and if the area affected, is small. Mowing after the bolt stage but prior to or at flowering can help reduce seed production and reduce seed spread. Since Marestail can germinate in the fall or spring, selection of the proper herbicide for the given situation is important. Use of herbicides is a costly option, unless infestations are localized and small. The cost of an herbicide application may not yield the economic benefits desired. Herbicide applications will only have an effect for one growing season. Spring applications of herbicides for Marestail may be better, usually very early spring – April thru early May. After early May, herbicide efficacy drops off. Marestail treated in the fall with products that do not have any soil residual activity will not control plants that germinate the next spring. 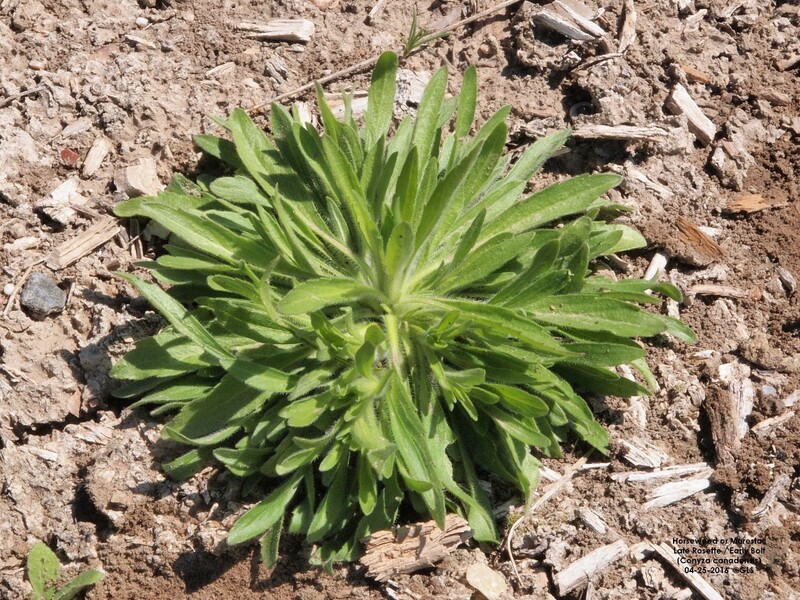 Marestail plants should be in the seedling to rosette stage and no larger than five leaf stage for effective control. Plants not effectively controlled will still produce seed. Careful consideration of the use of herbicides must be made. Use of these herbicides may injure other beneficial forbs and plants in the pasture / rangeland ecosystem and not have an effective cost benefit. Some herbicides that have shown to have some control or suppression of Marestail include 2,4-D ester, aminopyralid (Milestone), dicamba, triclopyr + fluroxypr (PastureGard HL), clopyralid (Stinger), chlorsulfuron (Telar XP), picloram + 2,4-D (Graslan L – Restricted Use Pesticide). Utilizing tank-mix combinations of products may enhance control. Combining products with different modes of action will help reduce herbicide resistance. Consult the specific herbicide label for instructions on how to treat Marestail / Horseweed for timing of application and rates. It is important to follow the product label unique to each individual herbicide. When the herbicide label allows, the use of a non-ionic surfactant may improve control. There are no biological control measures for Marestail known at this time. Be sure to select a product labeled for the site. Read, understand and follow all label instructions when using any pesticide. Create an Integrated Pest Management plan (IPM) combining different control strategies to manage Marestail and promote the desired plant community you want.